This video showcases all the different features of Sheetah and how to use them. Sheetah turns your composition into a single spritesheet file blazingly fast. 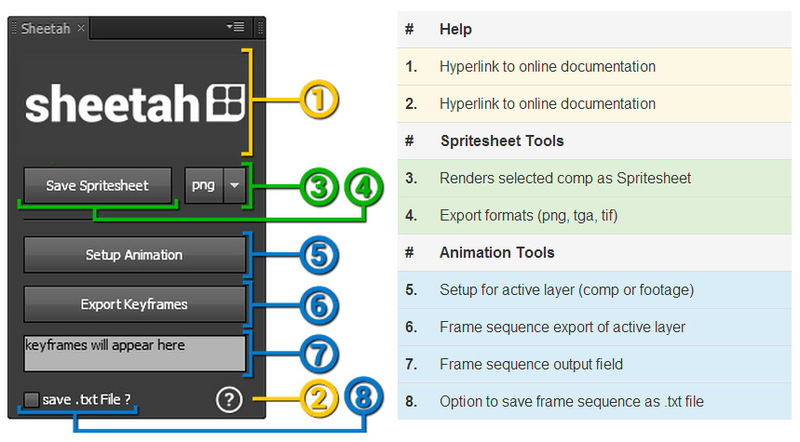 It is targeted for everyone working with spritesheet animations, like 2D/3D Game Artists. It also features tools to generate custom animation sequences. How to install Sheetah on your system. Adobe After Effects CS 5.5 or higher required. Please note that this package requires After Effects CS 5.5 or higher. It has been tested with CS 6 and CC. We put a lot of effort in creating sheetah. Still we decided to distribute it under the "Name your own price" policy. This way you can decide how much you want to pay for it or even get it for free. Sheetah features a persistent, dockable UI Panel. This way you can incorporate it with the existing UI and do not have to start the script manually. 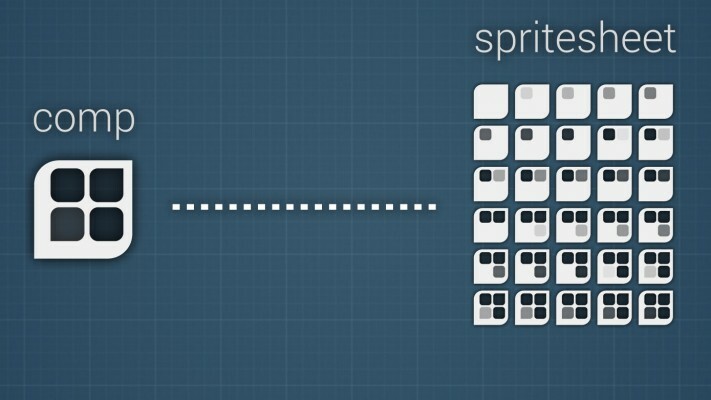 The Spritesheet Tools are the main feature of this extension. The goal was to simplify creating spritesheets as much as possible. You can export a spritesheet in 2 easy steps. Select the preferred export format for your spritesheet. At the moment the available formats are png, tga and tif. The script will automatically export the alpha channel to make your life easier. Sheetah will remember the selected format so you do not need to setup this option again. Sheetah automatically calculates the best possible pattern for the amount of rows and columns of the spritesheet. This means you do not need to set these values manually, yay! The Animation Tools have been developed to generate custom animation sequences based on your spritesheet. These are used especially in 2D or 3D games. Instead of simple forward or backwards playback you decide in which order frames ar played back. This is often done using comma separated frame sequences eg. : 1,2,2,2,3,3,4,5... In a nutshell these sequences give artists the flexibility to recycle their spritesheet to generate more complex animations. Start by selecting the composition containing your animation. Now wrap this composition in a new empty composition to start creating your custom sequence. Select the composition layer and click "Setup Animation". The script will add a Slider Control Effect among some other things. After its finished you can start creating your custom animation sequence by animating the Slider value. The Slider value represents the actual frame number of your composition. After you are satisfied with your custom animation sequence use the "Export Keyframes" button to export your frame sequence as comma seperated frame numbers. The result will be shown in the text field under the button. It will be repopulated everytime you click "Export Keyframes". To select all keyframes click into the textfield and hit strg+a on Windows or ⌘+a on Mac. The animation sequence can be exported as a .txt file as well. Simply click the corresponding checkbox. Everytime you click "Export Keyframes" the script will prompt you for a filename and export a .txt file containing your custom sequence. Retime nested comps with power and ease! Super lines lets you create and experiment with different lines animations with ease.